What is a deer feeder? Why do I need a deer feeder? When you love nature everything good comes on naturally. Let us enjoy our own little heaven of an amazing view by creating the best deer feeder. But do we know what we are talking about? Well, let us have a look. As animal enthusiasts or even deer hunters, deer feeders will definitely attract our attention when shopping. A deer feeder is an equipment used to offer feed to deer or wildlife. The feed is normally in the form of grain or a special blend of food which adds a nutritional value for wildlife. The good thing about the deer feeders is that they can be automatically or manually operated. Whichever the design is taken, they are all meant to draw deer to the hunting. If you are handy you can make your own feeder at home. It is all about the game love. You can always find these deer feeders in some feed programs. Now you know! I have my reasons why I need the deer feeder, unlike other technique. I tried a couple of methods, one which was the corn pile system, recommended by my friends but it only worked for a short period. The corn pile system attracted many other animals to the corns and so there was only little left for the deer. I am sure some us have experienced this problem. Are there any negative effects of deer feeders? Like any other techniques, the deer feeder has its own shortcoming even with its great value it adds to us. I do not have to rebait it often. I get accurate kills for the deer. It has proven to be healthier than the corn pile method. I can observe the deer at the feeder. Can cause damage to surrounding vegetation when animals congregate to feed. More reason than any other, we have to hunt a healthy deer, which is why we need the deer feeder the most. Where do I place the deer feeder? 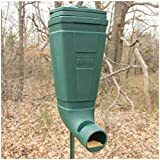 Which location for a feeder will attract deer? As beginners, we have asked these questions when we purchased the deer feeders. So, how do we choose the right location? I need a place where I can have a full view of the movement of the deer so that I am able to hunt according to the criteria of the wildlife management. I place my feeder where it is not prone to damage from the wild. It does not matter whether I am feeding for hunting or just to feed the wildlife, I need to be sure that I do not face vandalism of the feeder every awakening day. I am aware of the wrath of nature especially from plants which can reduce the visibility of the feeder to nothing. It is my major concern of the wild because I do not want to harm any. We are all conscious of the effects of weather and even the inclement weather itself. I always take note of this as I want the feed to be fresh and also allow the deer to feed without disturbance. I have created a shield on my feeder and raised it above the ground so that It is not affected by damp ground. I never install the feeder near any breeding sites for any animal. Do you want to hunt or have a predator hunt for you? It should never be the case. For this reason, I avoid interfering with the normal activities of the wild and keep my feeder away from predators. Did you know you deer are scared off by uncertain surrounding? The location for the best deer feeder should be away from busy roads, busy walking trails and the most important away from crowded estates. On the contrary, I locate the feeders where the deer always frequents. Generally, you can find the deer trails by following the travel and character patterns of the deer. Now that we have found the best location for the feeder, let us see the characteristics of a good deer feeder. What is suitable for me? Why is it suitable for me? We should be able to have the answers as we shop. I do not want a deer feeder that gets me sweaty for an entire day trying to set it up. I want a feeder that is an easy build. One that assembles quick and of course gives time for deer to visit. It may be a really good feeder with high-quality features that will blow my mind but it might be the one which needs me to hire a contractor. Who wants that? Every living thing locates to a food source. When I built my feeder at first, I got all kinds of wildlife in my reach. Oh, what a mess! I decided to focus on a feeder that allows only the deer to feed so that other animals strain to get to the feed. Serves them right (Just kidding). We all need to save up and channel the money to other needs. I have feeders that have the features that are of use to me. There are many sophisticated feeders all over the market but do I really need them? I draft what I require in a feeder if I have to. I mean I have got to save! There are a couple of deer feeders that can be used. There are electrical, manual or even rechargeable feeders. It can be a gravity deer feeder, a camera attachment or even a standing feeder. The timer feeders also dictate what I need in a feeder and when you feed. The food may just fall off it is too late. I always ensure it is what suits my budget, environment requirement or even the ability to maintain the feeder. Getting my own deer feeder that suits my necessities is just a tip of the Iceberg. How do I set up the best deer feeder? If a deer wants food, it will get it. If there is something you about the deer, is that they will visit the place they frequent. If the structure of the feeder is great, you can get more deer visiting. Get a guide here, a step by step procedure to help us out. Select the right location for the feeder at all times. Deer are always suspicious of their surrounding and the slightest movement will get them on their feet. Be sure to view the feeder at a distance from your home so you can keep track of their movement. What feed is good for the deer? The main question is what food does the deer love? We have to balance the kind of food we put in the feeding trough. We can get all kind of information for the adequate supplement for the deer at the stores. It cannot be a hard task. I remember to replace the food in the trough as often a possible but to keep it the same in proportion and the type of food. I do not want to divert them to another hunters trap. During the cooler moths, we can notice that deer will hover around the feeder. Food is scarce in the cold months and that is why it is always important to start feeding during this season. By getting to feed the deer all year round, I get the benefit of viewing a family coming to feed. It is truly a sight to behold. Do you worry when to feed deer? What quantity is enough to feed deer? We can quite ask these questions and be sure on what we do. For starters, Cameras are a great help to us when it comes to timing. I have been able to record the apt feeding time for the deer using the camera. If you do not have a camera, you have to be keen on observing and tracking of the deer in your area. With all the current technology, there is a timer feeder that will help us to time the feedings accurately. We, however, need to know their movement. The most incredible thing about the timed feeders is that we can control the amount of food that we dispense. We can say it is a budget cut machine. When is the best feeding time? I have recorded a lot of movement at dawn and at dusk and so this is when I dispatch my feeders with enough food for the deer and especially during the colder months. Overall, as a game lover, I feed deer all year round so I can have a firsthand glimpse of the unique life cycle just a distance away. The only service I do to my feeder is confirming that it works perfectly and that it is kept away from obstruction of any kind. There is a best deer feeder for everyone. All you have to do is pick one or two that fits your necessities. With its simplicity in operation, you can hold a whopping 80 pounds of corn. The simple material of tough plastic makes it best during all weather conditions. The design of the feeder is such that it can secure the feeder to the tree with the ratchet straps. It is also suitable where there is no tree. It has a molded-in channel at the back that allows a T-post to fit perfectly. The most significant feeder about the Redneck Outdoors T-post Gravity Feeder is that it allows only the deer to feed. Because of its collapsible feature, I recommend this feeder especially when someone is relocating. The adjustable feed rate intervals can be regulated offering a perfect idea of what kind animals are visiting. The startling thing about this feeder is that it can fit into feed container. The weather resistant varmint guard makes it excellent for any kind of weather. At the comfort of your home, you can set the timer using remote control. How convenient? Requires regular maintenance of remote and solar panels. The Backyard Boys woodworking GS26GR large platform feeder is considered the most durable feeder. With its height above the ground, it keeps the feed dry, non-moldy and away from moles. It has a perfect size to feed enough deer. The green color is durable and does not require regular painting. The digitally programmed feeder offers a lifetime of an assured reliability of its use. On time 1113 lifetime Elite feeder Timer only uses batteries that are durable. One can program how it works and operate at the comfort of his home. The aluminum housing offers good resistance to harsh weather conditions. It is suitable in areas with extreme winter seasons as it can be programmed to operate at any temperature. 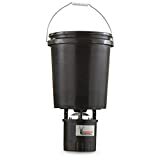 The Stovall 17F Wildlife manager feeder can hold up to twenty-five pounds of seeds. 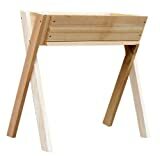 It is constructed with cedar ensuring its durability. The stainless steel features engraved in the feeder by dichromatic screws, washers, hooks and chains upholds the feeder’s quality. The wood in the feeder is coated with wood protector making it more attractive and easy to maintain. The large drainage holes allow small grains to drop. There are many methods to draw deer to that area of feeding. When to feed, how to find the best deer feeder is all at your fingertips. What you offer to feed and how you feed and the feeder all depends on your requirements. Make an order of your own feeder with our Deer Feeder reviews and let us enjoy what we love. Do not be left out of the experience.